Podcast: Can we pick winning funds? Can we pick winning funds? Back from holiday and with lots of ideas around what you do and don’t like for JSE Direct. That said main comment was not to really change except maybe some experts occasionally on broad topics. Markets falling and Top40 is down some 8% for the year so far. End of the world? Not likely. As always, traders know and obey your stops. Investors know your stocks and entry points. Naspers (JSE code: NPN) is under R3k and off some 30% since the November highs and is in large part why our market is under water as it’s the largest stock by a mile in the indices. MPC cut repo rate by 0.25%, 4 members voted for the cut and three for no change. No discussion of a 0.5% cut. Interestingly the VAT increase effective on Sunday is expected to temporarily add 0.6% to inflation. Moodys kept us out of junk and improved our outlook to stable from negative. Anchor group (JSE code: ACG) results were bleak but seemingly the bad news is now behind them and the share is responding well, up some 50% since the lows of January and this is a stock pick from Anthony Clark. How to start an investment club. Save interest on your home loan. I was on The Money Show with Bruce Whitfield earlier this week talking about money and selling everything. The interview is here. Can you pick a winning fund? 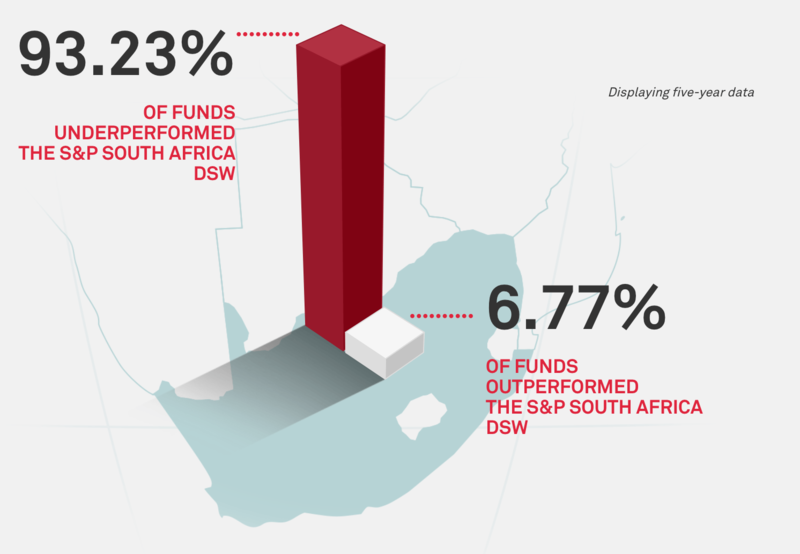 The latest SPIVA for SA is out and it is bleak reading for active managers in South Africa. Around 75% are beaten by the benchmark over one, three and five years. Benchmark is Domestic Shareholder Weighted (DSW) capped or normal. This means you have a 1 in 4 chance of picking an out preforming fund – very bleak odds. So here’s the question, and it is a real question. How does one pick the winning manager going forward? There most definitely will be those who out preform, some even consistently, but how do we spot them in advance? They themselves will tell you that past performance is no guarantee of future performance, and this is 100% true for a bunch of reasons. Changes in personal. A winning manager leaves, is the replacement as good? They had a few lucky calls or managed to avoid some disaster that beset the market. Skill or luck? As they get larger it becomes harder as your investable universe shrinks. I remember a Morningstar report from a few years ago looking at the US market that said the only reliable predictor of future returns was fees. The lower the fee the more likely the fund will out preform. This makes sense, but it is still not a full proof method. I also know a number of people who chart unit trusts with fairly good success. Either just normal technical analysis or relative performance. Of course tax is an issue here. If you have a method for picking winning funds let us know.